Thanks to Sonlight's training, my daughter Rachel is in the habit of integrating everything she learns into the 'big picture' of time and place. Before she can read anything, she looks at her timeline to understand where the story takes place in the context of history. She'll also find the story's location on the map. She loves to peruse The Timeline Book [RR120] from beginning to end. I feel she has a great grasp on the big picture. In her fourth year of Sonlight, Rachel (7) uses Google to locate where Little Pear (from Core B) took place. I discovered Sonlight 16 years ago and boy, am I glad I did! The high interest level of Sonlight books have given my active boys (and my more tranquil daughter) the opportunity to hear and learn from great books even if they couldn't sit still very long. Even in high school, we choose some books to read aloud because we enjoy books together and it has become part of our DNA. Although this photo is staged, 17-year-old Nathaniel really can maneuver a soccer ball while he reads or listens to Christie read. He is studying Core 300 and British Literature in his twelfth and final year of Sonlight. His three older siblings all used Sonlight from 6th grade through high school, graduated college, and are now working. You've seen Up, WALL-E, Ratatouille, Toy Story, and Finding Nemo. Now it's time to dig deeper into the wonderful films produced by Pixar Animation Studios with The Wisdom of Pixar: An Animated Look at Virtue. One of Sonlight's very own curriculum developers, Robert Velarde, takes you on a unique journey through Pixar's world. Virtue has never been so animated! 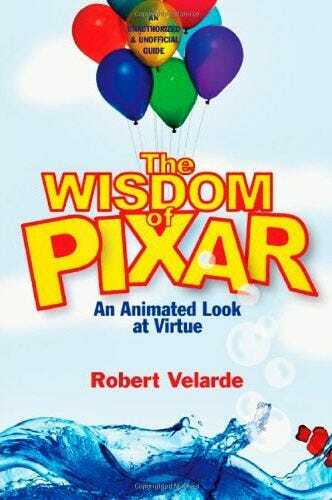 This is the first book to explore spiritual and moral themes in Pixar Animation Studios films. You'll have fun exploring virtues such as friendship in the Toy Story films, love in Up, family in Finding Nemo, courage in The Incredibles, and justice in A Bug's Life. 2 Hope and Imagination: "To infinity and beyond!" 3 Identity: Toy Story - "You are a toy!" 4 Justice: A Bug's Life - "For oppressed ants everywhere!" 5 Friendship: Toy Story 2 - "You've got a friend in me." 6 Humor: Monsters, Inc. - "These are the jokes, kid." 7 Family: Finding Nemo - "I have to find my son!" 8 Courage: The Incredibles - "Where's my Super suit?" 9 Adventure: Cars - "Life is a journey." 10 Ambition: Ratatouille - "I want to make things." 11 Technology: WALL-E - "Everything you need to be happy." 12 Love: Up - "I have just met you, and I love you!" The conference center is crowded with attendees eager to learn more about the intricacies of moral philosophy. Entering the main lecture hall, you are fortunate to get a seat close enough to see the panel members seated behind a long table. A dignified expression on his face, the panel moderator approaches the lectern while carefully adjusting his hat. As he taps on the microphone you hear him say, "Hello? Check. Is that better? Can everybody hear me? Today's opening panel discussion is about moral philosophy in Pixar films." You listen, confused. You had anticipated an academic gathering of scholars presenting erudite papers on the finer points of ethics. But the speaker is a cowboy doll you recognize from the Toy Story films -- Woody. You even catch a glimpse of the pull string attached to his back. "Let me introduce our participants," Woody continues, gesturing to the individuals seated behind the table. "First we have Buzz Lightyear, Space Ranger. To his left is Mr. Potato Head. Next to him we have Hamm and Luxo Jr. Lastly, we have John Lasseter, chief creative officer of Pixar Animation Studios." Something is not right. You glance at the stage and see a number of characters from the Toy Story films. Some are organizing papers and making notes, and others are chatting quietly. You see Buzz Lightyear, a space toy and star of the Toy Story films, speaking animatedly to Mr. Potato Head, who is wearing a beret, glasses and a goatee for the occasion. Hamm, the piggy bank, looks bored as he flips a quarter in the air, while the little white Luxo lamp is bobbing its "head," turning its light on and off and bouncing in place. The only human on the stage is John Lasseter, wearing a trademark Hawaiian shirt but looking unusually serious. A boxy-looking robot passes by and hands you a program. He accidentally drops the remaining pile of programs, then scrambles to collect them all and rushes off. You see a small white robot looking a tad upset, cleaning up after the boxy robot. This must be some sort of joke. Flipping through your program, you are surprised at the various topics and speakers scheduled: "Aretaic Ethics in the Twenty-First Century," presented by Bo Peep; "The Epistemological Virtues of Animal Rights," an address by Slinky Dog; "A Lasseterian Theory of Moral Philosophy," a preliminary treatise by John Lasseter; and "Emperor Zurg and the Problem of Evil," a peer-reviewed paper by Dr. Buzz Lightyear. "Today's panel discussion," continues Woody, "will feature an animated look at virtue and wisdom. Following the discussion, questions from attendees are welcome." Woody steps away from the lectern, which you now notice is a blue and red Tinkertoy container. Curious, you settle in for what you hope will be an enlightening discussion of moral philosophy. I do not intend for you to take this unlikely gathering seriously. Pixar Animation Studios is not working closely with moral philosophers to inject ethical ideologies into its films, nor is the studio actively engaged in studying arcane aspects of morality, virtue and wisdom in order to infuse films with deep ideas about right and wrong and the meaning of life. Nevertheless, films do tell stories, and in the process of telling stories, they present ideas. As Western culture continues to shift from a "Have you read ... ?" perspective to a "Have you seen ... ?" framework, the influence of films increases exponentially. So while Pixar films do not provide textbook examples of the many facets of moral philosophy, we can still learn much about virtue and wisdom from them. The purpose of this chapter, moreover, is not to attempt a detailed study of ethics, but to provide a sweeping introduction to the topic with a particular emphasis on virtue and wisdom.